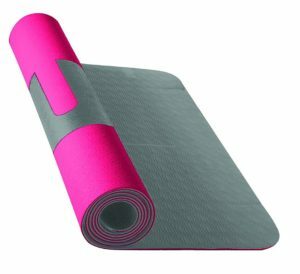 While the Nike yoga mat is a solid choice, we feel that other yoga specialty brands from Amazon provide better value or better performance. Note that Nike is an excellent brand for sporting goods, but they do not focus on yoga products. Read on for more details. The Nike Yoga Mat under the Fundamental or JDI (Just Do It) styling is the same 3mm yoga mat from Amazon as in Nike stores. Like other mats within a similar price range, the Nike yoga mat is made of closed-cell foam. To be exact, the mat is 95% styrene-butadiene-styrene and 5% polyester. A closed-cell design prevents the mat from soaking up unwanted dirt and bacteria, leading to easier cleaning and longer durability. At 3mm thick, the Nike yoga mat should be fine for basic yoga. If you prefer an extra thick yoga mat, though, you might prefer 6mm models from other brands. The textured surface should also provide a decent gripping surface, even under light perspiration. Overall, the quality of the Nike yoga mat is okay — definitely better than a cheap $15 mat from Walmart. The Nike yoga mat, though, costs about $25-30 from Amazon. We believe there are better mats for $20, and in particular, we recommend the Clever Yoga Better Grip (Amazon link). The Better Grip is cheaper, has a a better grip (hence the name! ), and also comes with a lifetime no-questions-asked full warranty. Plus, at 6mm, the Better Grip provides more cushioning, while still being light enough to carry easily. And it’s eco-friendly! Read our review of the Clever Yoga Better Grip here. If you instead want to get a genuine premium mat with the absolute best performance, we would recommend the Clever Yoga LiquidBalance (Amazon link). This mat costs around $80-100, but you are getting a premium rubber mat with the absolute best gripping performance in its class. The LiquidBalance beats out all other mats under extreme sweat conditions (again, hence the name!). You can read our review of the LiquidBalance here. Finally, if you want the most famous premium yoga mat, kind of like the iPhone of yoga mats, you should check out the Manduka Pro (Manduka company link). They are pricey, but worth the cost. 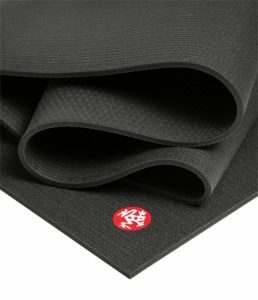 You can read our review of the Manduka mat here. If you already bought or really want to get the Nike Fundamanetal or JDI yoga mat, go ahead. However, if you still have time to reconsider, we recommend the other models as described above.